Outclassing their contemporaries, our aluminium windows use Smart’s profile to ensure industry leading quality and function. 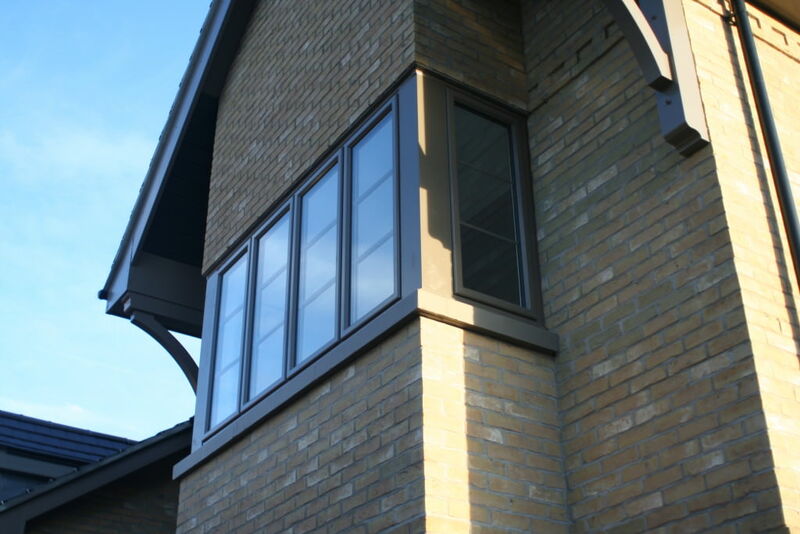 Aluminium windows are designed to achieve the highest standards of function, without compromising on style. Select Products offers a wide range of aluminium windows. This includes versatile multi-functional designs, such as tilt and turn, which enhance the user experience by providing an assortment of opening functions. All of our aluminium windows are installed with the unparalleled profile from Smart Architectural Aluminium, ensuring premier product quality and performance. Aluminium window frames have made great strides in window performance innovation, becoming unsurpassed in strength, versatility, energy efficiency and security. Upgrading your home with sleek aluminium windows from us will give you the benefit of combining the UK’s leading window supplier with the exceptional skill of our expert professional installers. Our extraordinary selection of aluminium windows is available throughout Leeds, Ilkley, Yeadon, Harrogate, Horsforth, Pudsey, Bradford, Wetherby, Otley and West Yorkshire. Select Products ensures we employ only the most highly skilled window fitting experts. Our team of installation professionals possess many years of aluminium window fitting experience, meaning you can be sure not to encounter some of the common issues caused by improper installation, such as unexpected draughts or leaks during poor weather. We understand that renovating your property can be a stressful time. 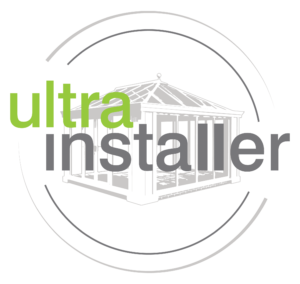 To minimise disruption to your day we always aim to provide a quick and efficient installation service to all our customers. 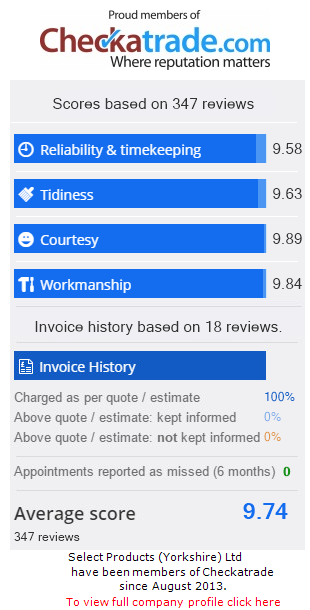 We pride ourselves on leaving satisfied customers, and are thrilled to have achieved excellent reviews on Checkatrade, praising our reliability, courtesy and workmanship. What Can Aluminium Windows Bring to Your Home? Aluminium windows are the keystone for the modern look. Their slim frames and neat finishes exhibit precision and style, producing an aesthetic for your home that will always demand appreciation and admiration. Aluminium’s inherent strength allows it to be neatly moulded into shape, ensuring a smooth, sleek appearance throughout. Once installed there will be no need for time-consuming re-painting or re-varnishing, and you can be sure that your aluminium windows will never discolour or rust. As well as being pleasing on the eye, aluminium’s form also brings beneficial qualities. The thinner frame cuts down on bulk, which means a larger surface area of glass. This allows you to reap the benefits of improved views and increased sunlight into your home. Aluminium windows also create the illusion of space with their reduced bulk and therefore will fit seamlessly into your property. An open, airy atmosphere is flattering to any home, be it traditional heritage houses or modern builds alike. All of our aluminium windows come with a large choice of colours, including the KL Standard range, the RAL Standard range as well as an exclusive Sensation Range with beautifully textured shades and finishes for any preference and budget. We understand that making a house a home requires a personal touch. That’s why our versatile colours allow your aluminium windows to be an extension of your taste and home’s character. Combining our various decorative options will allow you to create windows as unique as you. Aluminium windows are available in a wide range of styles and can be adapted to the size of your property. Versatility in both function and style is important in keeping up with unpredictable weather and the constant change of modern day home trends. Tilt and turn windows are a perfect response to variations in weather, allowing controllable ventilation for simultaneous comfort and classic elegance. In contrast, aluminium sliding sash windows gives a modern-day twist on the 19th century inspired style. Why Choose Our Aluminium Windows? Aluminium window frames may be slender, but this is not proportionate to their strength. Highly durable and strong, aluminium window frames will not rot, warp or unhinge. This allows our windows to add an effortless style to your property with the promise of brilliant longevity. When compared to uPVC, aluminium has proved to hold greatly increased standards of strength and durability. They can be relied upon as a worthy investment for your property. High performing and low-maintenance, aluminium windows are an ideal hassle-free option for any home and budget. Aluminium is a fantastic foundation for home security, proving itself to be robust and safe. All our windows are fitted with industry-leading hardware supplied by our award-winning manufacturers. Maximum security is ensured by installing the shootbolt, multi-locking system to our windows, meaning you can rest assured knowing that your home is well protected. We understand that home security is paramount, and this is why our aluminium windows are all manufactured with resilient and long-lasting hinges and panels. This assures a long-lasting product resistant to being tampered with or attacked by any would-be intruders, keeping you and your family safe. Our contemporary, modern designs offer the perfect blend of safety and style. Our sleek and stylish aluminium windows are designed to be as highly performing as they are beautiful. Leading thermal efficiency is ensured by Thermal Breaker Technology, and our aluminium windows utilise the remarkable insulating material polyamide. This is installed in the window frame to stop air permeability, and increase to heat retention. An increase in heat retention means a house that stays warmer for longer. This is ideal for customers that want to see a decrease in their annual heating bills. A more energy-efficient property benefits both home owners and the environment alike by saving you money whilst reducing the carbon footprint of your property. If you have decided that the modern aesthetic and high performance power of our aluminium windows would enhance your home, take a look at our stunning range using our clever online quoting engine. We can provide you with a personal quote instantly with just the click of a button. Find out more on our competitive window prices by contacting us via our online contact form. If you’d prefer to speak to one of our team directly, you can call us on 0113 257 8933 for Leeds, or 0142 321 0021 for Harrogate and one of our friendly employees would be happy to help.